Back2thebeginning Farm: Growers, Gatherers &amp; Crafters of Rare Fruits, Nutritious Leaves, Handcrafted Shampoo &amp; Body Bars &amp; lots, lots more... All our goods are organically grown, hand gathered &amp; crafted on the sun kissed Back2thebeginning pesticide free Farm. We invite you to treat yourself or someone you love to our natural hand-tailored creations. Once you do you'll be back, back2thebeginning. Tended to daily, to ensure the best quality of all things green &amp; grown. We even hand pick off our pests. * Look for our occasional "HARVEST SPECIALS" great items for a limited time at a special price. Please take care to assure that the all shiipping information is correct &amp; accurate. We are not responsible for inaccurate or inconsistent address/shipping information. Most items are perishible &amp; should be consumed with just 1-3 days of arrival. Refridgeration is often a good option to provide extended freshness. 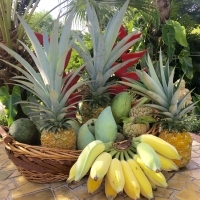 Do keep in mind our goods are coming from a tropical environment &amp; refridgeration may change the appearance, texture &amp; overall experience of the fresh item. Best bet... Consume immediately Any questions or concerns must be addressed upon date of receipt of item, photo&rsquo;s are required. Please note we ship on Mondays, Tuesdays only. "For Goodness Sake" Holidays or inclement weather may delay shipments. Please note: We take great care to grow, pick, pack &amp; ship our delicious &amp; nutritious goods... however, we have no control of USPS timeliness or care of handling, hence, we can not guarentee items arrival date or condition upon arrival. :( Due to the nature of our products all sales are final. No returns or refunds. We'll send out an invoice & you simply complete the order! USPS Priority on all fresh fruits & fresh leaves. Working Hand in Hand with Mother Nature! Adjustments will be made on invoice. We are happy to offer shipping discounts on multiple orders. Most all of our Farm fresh items are perishable ... so to assure quality of our products we' ll pick & pack them same day, then we send them on their way to you with our greenest of blessings. So, orders are generally held till Monday &/or Tuedays to assure freshness. In our line of business "Freshness Counts"
If you need your item sooner, Let us know... Over night orders might be duable, We'd be happy to look into it for you. Please note, this will incur additional shipping charges & handling fees.